Last year, the major developments in “Natural Language Processing” were about Transfer Learning. Basically, Transfer Learning is the process of training a model on a large-scale dataset and then using that pre-trained model to process learning for another target task. Transfer Learning became popular in the field of NLP thanks to the state-of-the-art performance of different algorithms like ULMFiT, Skip-Gram, Elmo, BERT etc. Elmo embedding, developed by Allen NLP, is a state-of-the-art pre-trained model available on Tensorflow Hub. Elmo embeddings are learned from the internal state of a bidirectional LSTM and represent contextual features of the input text. It’s been shown to outperform previously existing pre-trained word embeddings like word2vec and glove on a wide variety of NLP tasks. Some of those tasks are Question Answering, Named Entity Extraction and Sentiment Analysis. There is a pre-trained Elmo embedding module available in tensorflow-hub. This module supports both raw text strings or tokenized text strings as input. The module outputs fixed embeddings at each LSTM layer, a learnable aggregation of the 3 layers, and a fixed mean-pooled vector representation of the input (for sentences). To use this module first, let’s download it to the local. # Download the module, and uncompress it to the destination folder. word_emb: the character-based word representations with shape [batch_size, max_length, 512]. lstm_outputs1: the first LSTM hidden state with shape [batch_size, max_length, 1024]. lstm_outputs2: the second LSTM hidden state with shape [batch_size, max_length, 1024]. default: a fixed mean-pooling of all contextualized word representations with shape [batch_size, 1024]. The output message_embeddings is of shape (2, 6, 1024), as there are 2 sentences with max length of 6 words and for each word 1D vector of length 1024 is generated. It internally tokenizes it based of spaces. If a string with less than 6 words would have been supplied, it would have appended spaces to it internally. The output will be similar. Here, by default it outputs a vector of size 1024 for each sentence which is a fixed mean-pooling of all contextualized word representations. Normally while using it in a classifier we can use this output. We will be using First GOP Debate Twitter Sentiment data, which contains around 14K tweets on the first 2016 GOP Presidential Debate. We are making a binary classifier, hence will ignore tweets with neutral sentiment. First, need to import the necessary modules for this. Then we need to make a function which will perform the pre-trained Elmo embedding on inputs. Then, we need to build the architecture. Here we are building it using high level keras api as it is easier to use. We are using the functional approach to build a simple feed-forward neural network along with regularization to avoid over-fitting. Now since the model architecture (compiled) and data both are ready, it is time to start training and saving the trained weights. It seems after 4th epoch there is not much change in accuracy. You can draw the same for loss value also. To have a better idea when the model is achieving its destination, it has to be trained for more epochs (means added cost as it is very computationally intensive and require GPU :-) ). Now to predict with the trained model, we need to first process the text and make an array of it. Now we can start a tensorflow session, where we will call the model architecture first and then load the weights from the saved file. Calling the predict API call, it will give us the sentiment probability of each text. The less is the score, the more negative sentiment is embedded in the sentence. I have printed time just to show how much time is required, It took 0.63 seconds for two sentences in Tesla k80 gpu. In i5 processor cpu, it took 14.3 seconds. Since it is a very computationally intensive process especially due to highly complex architecture of Elmo Embedding, use of accelerator is required in real time. 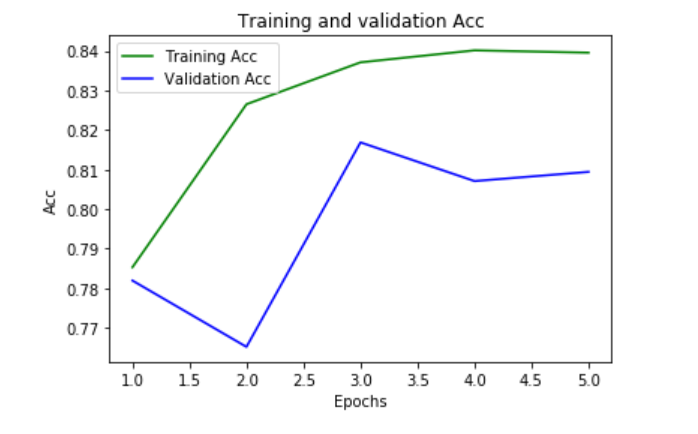 If you see in above training we achieved an accuracy of 0.8094 on Elmo Embedding, while with pre-trained word2vec, glove and online embedding the accuracies were 0.7821, 0.7432 and 0.7213 respectively. These were the results with the same data processing after 5 epochs.